Ransomes Jacobsen has introduced a new Turf Groomer™ to fit their range of Eclipse walking greens mowers. The new groomer for all Eclipse 125mm (5”) diameter cutting cylinders incorporates several of the same enhancements - consistency, serviceability and ease-of-use, developed for the improved groomer on 178mm (7”) diameter units on their LF fairway mowers released by the company in 2007. "This unit was designed specifically to give Eclipse users the ability to groom their turf easily and regularly with a great deal of consistency," said Richard Comely, Ransomes Jacobsens' product manager. "Grooming is an important cultural practice for any course interested in maintaining healthy turf at the highest level, and this new groomer for 125mm diameter units makes maintenance, adjustments and functionality substantially easier." • The new groomer is "always on," meaning that it is a continuously running system that operators do not have to turn on or off independently. • They begin to spin when the mower is turned on, helping to self-clean the front roller and prevent clogging. • There are fewer moving parts, meaning fewer repairs and replacement parts. • All adjustments are made from the front of the reel with a single 13mm (0.5”) spanner and greasing the bearings is easier. • The new groomer holds its adjustments accurately, returning to the last setting and specified height when lowered into action. • The unit can be lifted to bench grind cylinders without removing any groomer components. Jacobsen introduced the industry's first Turf Groomer in 1986 and pioneered the concept of pairing intersecting groomer blades with a grooved front roller to cut horizontal "runners" more effectively. 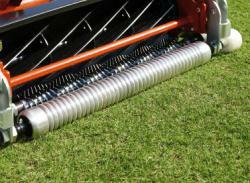 The Jacobsen Turf Groomer also has a short roller base to prevent scalping on contours and undulations.